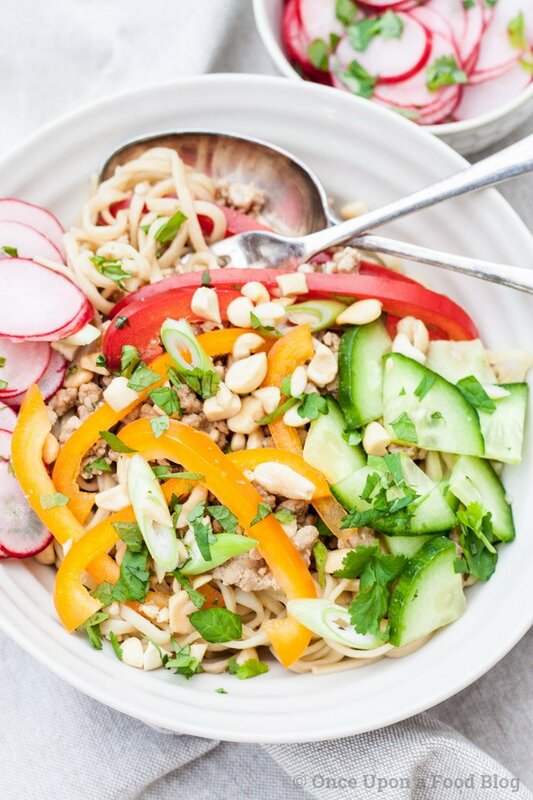 Noodles with a savoury garlicky turkey mince topped with any combination of cucumber, peppers, spring onion, avocado, herbs, peanuts and my lime pickled radishes. Delicious. My eldest loves noodles, totally loves them. If it were up to her we would have noodles for dinner most days. Whenever we get a Chinese take away she is always quick to ensure that we have ordered a generous portion of them – Chow Mein, vermicelli, flat noodles, rice noodles. Any noodles cooked any which way. She’d take the lot. 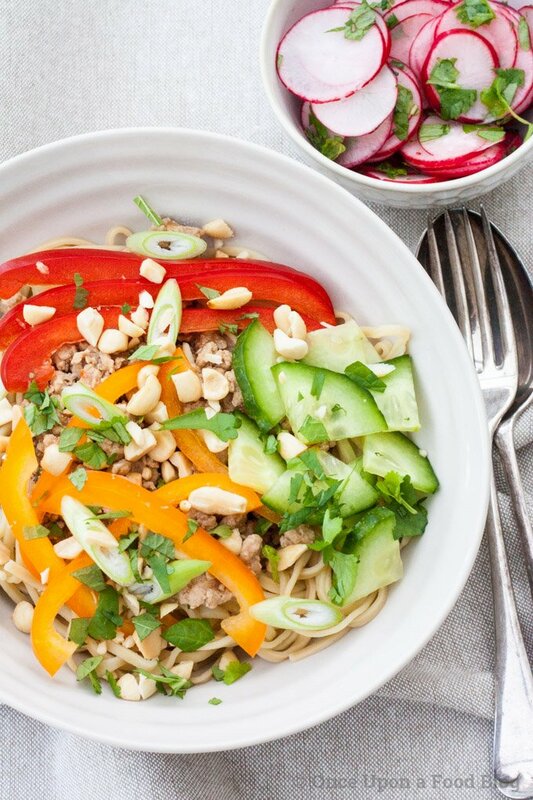 Presently my Thai turkey noodle bowl is her favourite dish I cook at home. It’s one that I love too. Partly because it’s so quick and simple to make and partly because everyone in the house eats it with no complaints at all. Any Mums out there catch my drift? I love cooking with mince because it’s so versatile. Lately I’ve been trying to mix things up a bit by using turkey mince, not just always plumping for beef or pork. Making sure you pack lots of flavour into it is important as it starts off a little bland but this recipe does that well. Loads of flavour goes into the mince itself with the addition of onion, garlic, ginger and soy and sweet chilli sauces. But, for me, the magic is in the toppings. These are totally optional and each person can pick and choose as they like which is what makes this such a family friendly dish. 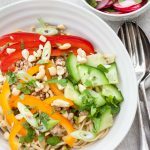 I do little bowls of finely sliced cucumber, yellow and red pepper, chopped mint, basil and fresh coriander, chopped salted peanuts, sliced spring onions, sometimes some sliced avocado, and of course my lime pickled radishes. I then put all the toppings on the table and people help themselves as they wish. Sliced cucumber and raw pepper on a hot noodle dish may sound a little unusual, but believe me it works. Somehow all the flavours and textures come together to make a delicious bowl of goodness. Place the cooking oil into a non-stick pan. Add the mince, onion, ginger and garlic and cook over a low heat, breaking up the mince as you go. Measure out the sherry, chilli dipping sauce, soy sauce and tamari into a bowl. Once the mince is cooked and the onion has turned translucent add the sauces from the bowl and stir over a medium heat until the mince is thoroughly coated and some of the liquid has evaporated. Now add the chicken stock, stir and place a lid on the pan. Simmer very gently for a few minutes. Just before serving, stir the cornflour into about 10ml water to create a thin paste. Turn the heat down on the mince to ensure it is not bubbling, then add the cornflour, stirring as you do so. Turn the heat back up and simmer. Now check the sauce. If it is too thick then add a dribble of water or stock, if too thin then you can thicken further with a little more cornflour. Cook according to the packet instructions. Drain. Put all the prepared toppings in separate bowls and place on the table. Divide the noodles between four bowls. Place the turkey mince over the top. Take to the table and allow everyone to take the toppings they wish.